WASHINGTON (Reuters) - Congressional Republicans reached a deal on final tax legislation on Wednesday, clearing the way for final votes next week on a package that would slash the U.S. corporate tax rate to 21 percent and cut taxes for wealthy Americans. Under an agreement between the House of Representatives and the Senate, the corporate tax would be 1 percentage point higher than the 20 percent rate earlier proposed, but still far below the current headline rate of 35 percent, a deep tax reduction that corporations have sought for years. As they finalised the biggest tax overhaul in 30 years, Republicans wavered for weeks on whether to slash the top income tax rate for the wealthy. In the end, they agreed to cut it to 37 percent from the current 39.6 percent. That was despite criticism from Democrats that the Republican plan tilts toward the rich and corporations, offering little to the middle class. "I think we've got a pretty good deal," Senate Finance Committee Chairman Orrin Hatch told reporters. The emerging agreement would repeal the corporate alternative minimum tax, set up to ensure profitable companies pay some federal tax, and expand a proposed $10,000 cap for state and local property tax deductions to include income tax, lawmakers and sources familiar with the negotiations said. It was also expected to limit the popular mortgage interest deduction to home loans of no more than $750,000 and provide the owners of pass-through businesses, such as sole proprietorships and partnerships, with a 20 percent business income deduction. The deal would gut part of the Obamacare health law by repealing a federal fine on individuals who fail to obtain health insurance, while authorizing oil drilling in Alaska's Arctic National Wildlife Refuge. Both add-on measures were part of nailing down sufficient votes for passage. Moving the corporate tax target rate to 21 percent from 20 percent gave tax writers enough revenue to make the tax cuts immediate, Republican Senator Ron Johnson told reporters. News of the deal began circulating just before a formal House-Senate conference committee began debating it in public, leading Democrats to decry the gathering as a sham. A final bill could be formally unveiled on Friday, with decisive votes expected next week in both chambers. Despite expressions of confidence about passage from party leaders, the path to a final vote in the Senate could still be perilous. Republicans, who hold a 52-48 majority in the 100-seat Senate, can lose no more than two votes on the tax bill. Republican Senator John McCain, who has brain cancer, was in a military hospital to undergo treatment for the side effects of cancer therapy. At least three other Senate Republicans still seemed to be undecided, including Arizona's Jeff Flake, who was not specific about his hesitation in brief hallway remarks to reporters. Bob Corker, a fiscal hawk, said he was undecided on whether to support the bill. He told reporters: "My deficit concerns have not been alleviated." Susan Collins, who helped sink her fellow Republicans' efforts to dismantle former Democratic President Barack Obama's healthcare law earlier this year, said she would not make a final decision on which way to vote "until I see the bill." 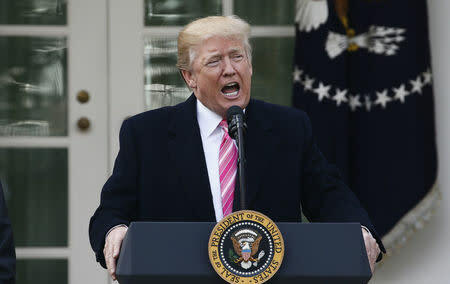 In a White House speech, Trump said the Internal Revenue Service had advised that if he signs the bill into law before Christmas, the tax cuts would take effect in February. The IRS had no immediate comment. But a Trump administration official said the IRS would have to readjust its paycheck tax withholding tables for employers and that new withholding levels would take effect in February. Under the bill, tax returns being filed next year for 2017 would not be affected, but returns filed in 2019 for 2018 would. Trump appeared in the White House with several middle-class families he said would benefit from the tax bill. The Joint Committee on Taxation and the Congressional Budget Office, both nonpartisan research units of Congress, have forecast that wealthy taxpayers and businesses would gain disproportionately from the debt-financed Republican proposals. As drafted, the Republican plan was expected to add as much as $1.5 trillion to the $20 trillion national debt in 10 years. With that in view, Republicans have been urgently trying to finalise details of their package without increasing its estimated impact on the federal deficit and the debt. Stock markets have rallied for months in anticipation of lower taxes for businesses. The benchmark Dow Jones Industrial Average Index <.DJI> closed up 0.33 percent at 24,585.43. With their defeat on Tuesday in an Alabama special U.S. Senate election, Republicans were under pressure to complete their tax overhaul before Christmas and before a new Democratic senator can be formally seated in the Senate. Democrat Doug Jones' victory in Alabama came hours ahead of the final tax deal. When Jones arrives in Washington, the Republicans' already slim Senate majority will narrow to 51-49. Fast action by Republicans on taxes would prevent Jones from upsetting expected vote tallies since he will not likely be seated until late December or early January. Senate Democratic leader Chuck Schumer called on Republicans to delay a vote on overhauling the tax code for the first time in 30 years until Jones can be seated. But that was unlikely. "Who would've thought they could have made the bill even less favorable to the middle class and more slanted towards the wealthy?" Schumer told a news conference. Is There An Opportunity With Pason Systems Inc.'s (TSE:PSI) 34% Undervaluation?